Hello there Cake Friends!! It's fall... it's finally fall here in Maryland!! It's been too long since I've created anything for the blog. The summer has been busy and I've soaked up every moment I could with my kids before they returned to school. But now we are back into our routines and I now have time to experiment and share some of the fun and crazy cake ideas I've had! So this week the Anne Arundel County Fair is in town and I've worked on so many random projects - from a clay sculpture of a hermit crab to sewing a skirt - to enter in this year's fair, but as I gathered my fun pile of entries together I realized I didn't make a decorated cake for the fair!! Oh no!! What could I make in a hurry? So I grabbed my Styrofoam dummy cake and threw open my cake cabinet drawers to see what supplies I had to work with. 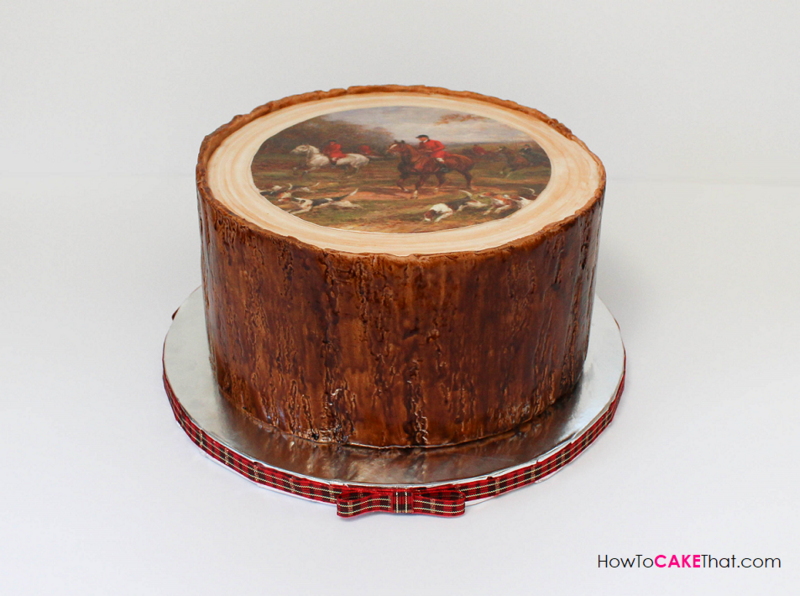 I noticed my silicone tree bark impression mat that I had purchased from SugarDelites.com and almost immediately thought of creating a tree stump cake... but I wanted to make this one different! I wanted to make something that would appeal to the fair visitors (the farmers and horse owners)... it had to be equestrian themed! Growing up on a farm we always had art pieces, furniture and blankets that were horse theme around the house. And one of my mom's favorite horse themes was the English Fox Hunt! One of the rooms in our home was known as the "hunt scene room". And when I think of the style of the decorations in that room I remember seeing the art mostly paired with a natural wood trim or frame. 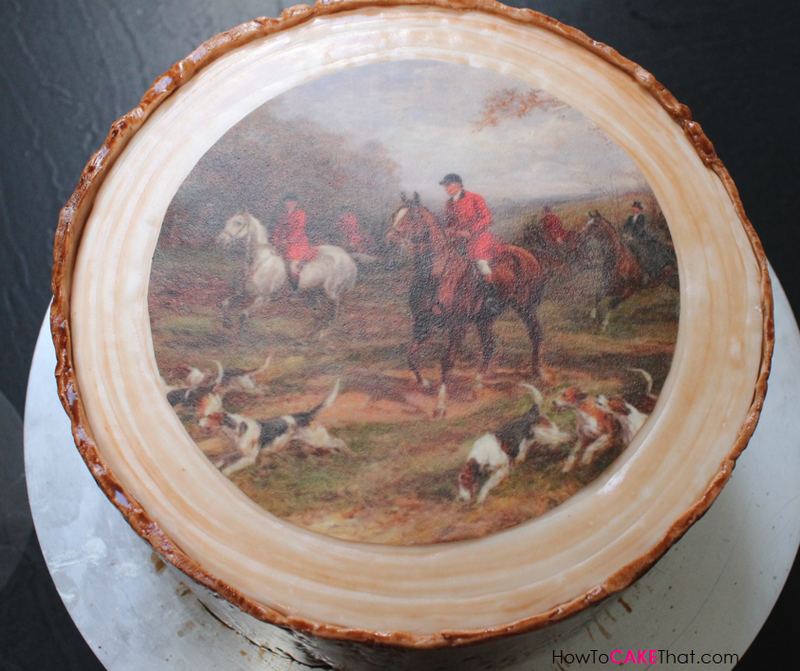 And I thought that since this cake would have a natural wood appearance an edible image of a Fox Hunt placed on top of the cake would complete the look I was going for! Finding the perfect image to complete this cake was probably the hardest part! I spent TOO much time searching Pinterest and Google to find just the perfect fox hunt image. And once I found it I knew this was the one I wanted!! This gorgeous scene was painted by a talented man named Heywood Hardy. And if you'd like to use the exact picture I did you can find it by clicking here. I copied this image to Paintbrush and printed it with 1" margins and it came out the perfect size! 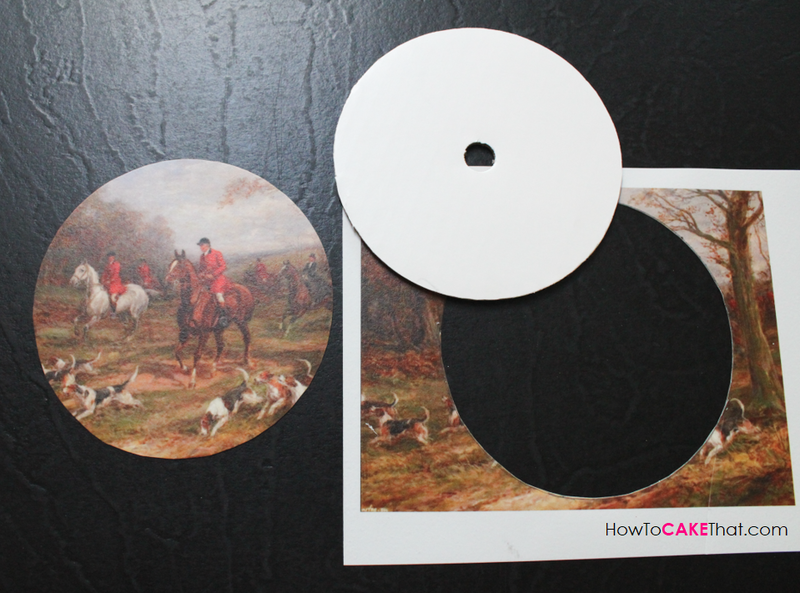 To cut out this picture in a perfect circle, I used a 6 inch Wilton cardboard cake round as a template. I placed the cake round over the edible image printed onto icing sheet (make sure your image is completely dry before you do this!!) and traced around it with a pencil. I carefully cut out the picture and made sure I trimmed just inside of the pencil marks to ensure there would be no pencil marks on my edible image. Then I covered my 8" Styrofoam dummy cake with fondant following the same method I used to create the Tree Stump Cake Tutorial. 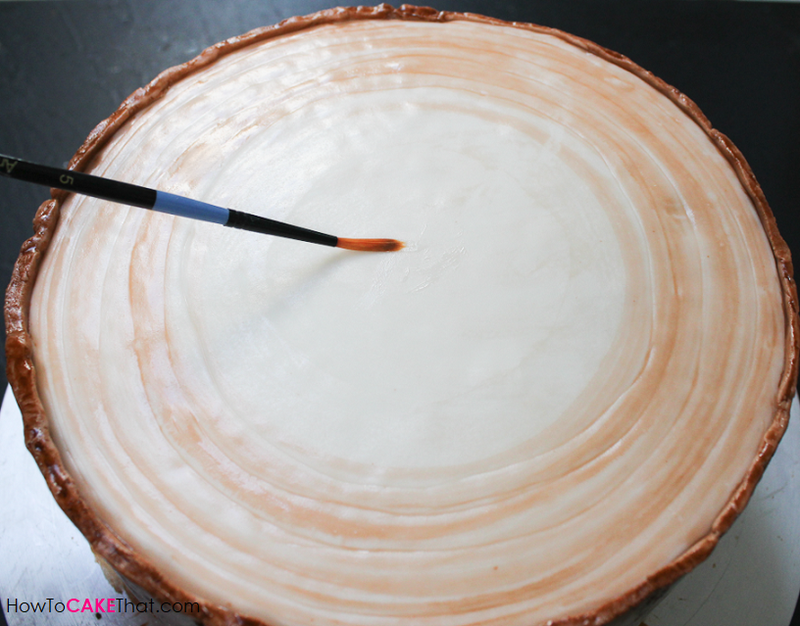 Once I had covered my cake, I brushed the center with a little piping gel to help the edible image stick. 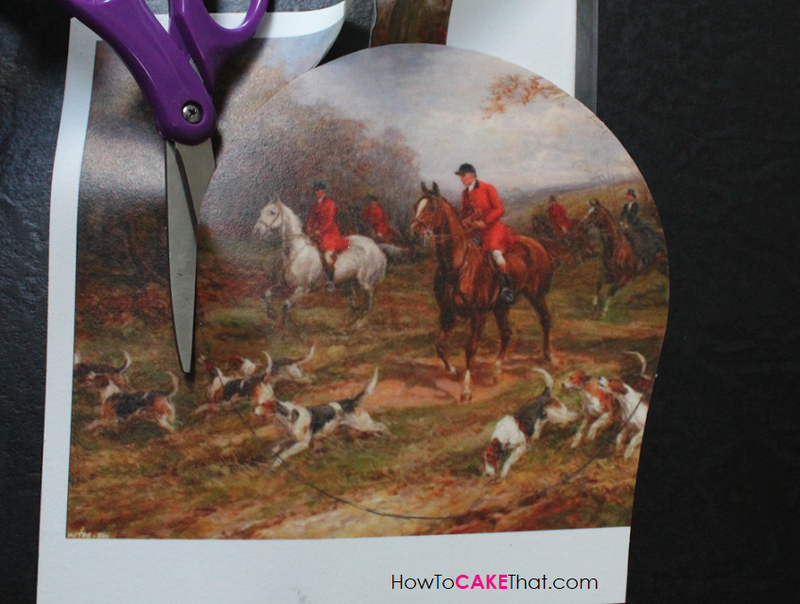 Then I carefully peeled the clear backing off of the image and pressed it to the center of the cake... and viola!! 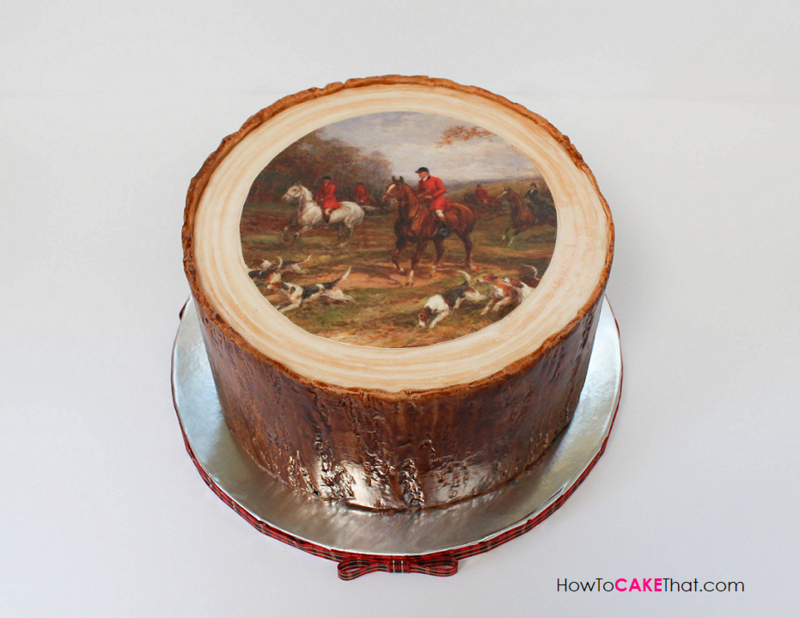 Easy and quick Fox Hunt theme cake! There was so much more I wanted to do to this cake, but I simply ran out of time :). I wanted to cover the cake board in hunter green fondant and somewhere put something gold on the cake, but next time I'll plan a little better! Ohh.... and one more thing! Finding a ribbon to perfectly match this cake was a bit of a challenge! But thankfully stores put out their Christmas ribbon early and I found this beautiful red plaid ribbon at JoAnn Fabrics! Most of the red or green plaids I had found all looked Christmassy... but JoAnn's had the perfect one!! I hope you guys have enjoyed this tutorial! God bless! !